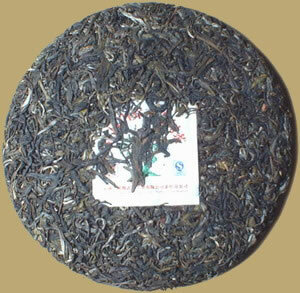 Jingmai wild forest of ancient tea trees is located at the southern tip of Yunnan. The forest is one of the most well preserved large wild tea plantations, it has continued to flourish from the time of the beginning of the Chinese Sung Dynasty to the present due in part to the area's fertile soil, good climate, lack of pollutants and remoteness from modern cities. This raw cake was compressed by stone mold - traditional Bingcha processing method to avoid breaking tea leaves. It yields a bright yellow liquor with a rich, smooth mouthfeel and long-lasting flavor. A nice raw Pu-erh for drinking now or putting away for aging.